India ended a 13-year wait to clinch their fourth Azlan Shah hockey title, comprehensively defeating hosts Malaysia 3-1 in the finals of the five-nation tournament here today. Former hockey Olympians today hailed India's fourth Azlan Shah title triumph that came after a span of 13 years, saying the win will provide the national team with the much-needed boost ahead of future international assignments. India, who finished runners-up in the event last year losing to Argentina, today defeated hosts Malaysia 3-1 in the finals of the five-nation event in Ipoh, Malaysia to lift the Azlan Shah title for the first time since 1995. Union Sports Minister M S Gill today congratulated Sandeep Singh-led Indian hockey team for winning the Azlan Shah Cup tournament in Malaysia. Former Australian coach John Buchanan today hit back at Sunil Gavaskar for taking a dig at his modest playing career and questioning his success as coach, saying his similarities with ex-captain Steve Waugh took the team to dizzy heights. Even before the Rajasthan Royals could start their title defence in the second Indian Premier League, the Shane Warne-led side suffered a setback after local outfit Nashua Cape Cobras handed them a 27-run defeat in a Twenty20 practice match at Newlands. American Kenny Perry and Angel Cabrera of Argentina shared the lead on 11 under par after Saturday's U.S. Masters third round at a rain-softened Augusta National. Skipper Sandeep Singh, who stroked in six of India's 12 goals, was declared Player of the Tournament for being the top-scorer of the event as well. Arjun Halappa (8th minute), Prabhjot Singh (20th) and Shivender Singh (41st) sounded the board for India through neatly worked out field goals, while Misron (11th) reduced the margin for the hosts. Earlier in the day, New Zealand pipped Pakistan 2-1 in a play-off match to secure the third spot at the Azlan Shah Stadium. High on confidence after their 3-0 win against Malaysia during the round-robin stage, India, who last won the tournament in 1995, started making forays into the rival half from the word go. Although, it was the first match in the tournament that Sandeep did not score a goal today, it hardly mattered for the world ranked 10th as Arjun gave India the the lead in the eighth minute through a neatly worked out field goal. The lead was, however, short-lived as Misron drew parity, much to the delight of the home crowd, in 11th minute with a strike from close range. Undeterred, the Indian forwards stepped up the attack and started making repeated inroads into their opponent's citadel and eventually managed to regain the lead when Prabhjot scored through another field goal nine minutes later to go into the breather 2-1. The Indians, who last year lost in the finals 1-2 at the hands of Argentina, continued to maintain the pressure on the Pakistani defence in the second session as well. Center-forward Shivender joined the party when it mattered and made it 3-1 just six minutes after the start of the second half. Trailing 1-3, the hosts tried hard to force their way into the match but the veteran Dilip Tirkey-led Indian defence stood firm and seemed in no mood to give Malaysia any opportunity of a comeback. With this victory, India enjoy a 3-0 win-loss record over Malaysia in the event. The Indians last time won against the hosts way back in 1985. Former hockey Olympians today hailed India's fourth Azlan Shah title triumph that came after a span of 13 years, saying the win will provide the national team with the much-needed boost ahead of future international assignments. India, who finished runners-up in the event last year losing to Argentina, today defeated hosts Malaysia 3-1 in the finals of the five-nation event in Ipoh, Malaysia to lift the Azlan Shah title for the first time since 1995. Former India international and junior team coach AK Bansal said the eight-time Olympic champions desperately needed the victory to bring the game back on track. "The win was very important. It is a significant achievement by the team and will help them in preparations for future tournaments. It is a morale booster for players," Bansal told PTI. He added that although the competition this year was not of high standard, yet the win means a lot to the former champions who missed the Beijing Olympics last year. "It's right, contenders were not so tough in the tournament, but all the teams were of equal strength. But to be fair, it has great significance as you can never assess a team's performance on artificial turf." Former India captain and a member of the ad-hoc selection committee, Zafar Iqbal echoed similar feelings but cautioned the team about tough competition in the upcoming Asia Cup and 2010 World Cup. "It's (the win) undoubtedly a huge morale booster for the team, but we can't think big about it. The team should now focus on Asia Cup and next year's World Cup," he said. Ashok Kumar, son of legendary Dhyanchand, and a member of the ad-hoc selection panel, credited the victory to collective effort of the team, including coaches, officials and support staff. "It's a wonderful victory. 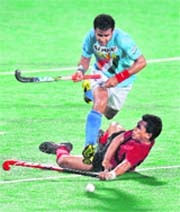 The win was very important to regain Indian hockey's past glory. It's a confidence booster for the team," he said. He also heaped praise on young Sandeep Singh for not only becoming the Player of the Tournament but also for his leadership qualities. "Sandeep led from the front. He displayed amazing skills with the stick and also a mature head as captain." "I am delighted to know that India have won the Azlan Shah Cup hockey tournament in Malaysia today. I congratulate the team," Gill said. "I see that Indian hockey team is on the rise. we will do everything to support it," the minister added. Chandigarh: Punjab Deputy Chief Minister and Shiromani Akali Dal (SAD) President Sukhbir Singh Badal congratulated the Indian Hockey team for lifting Sultan Azlan Shah Cup by beating Malaysia 3-1 in the final. "There were always people who were more than willing to put the knife in, and the fact that I never played Test cricket was simmering in the background of these digs, particularly by a select few," Buchanan was quoted as saying by the 'Times'. "I never shook the feeling that the axe was always hovering," he added. Buchanan, who is now the Kolkata Knight Riders Cricket Manager, last week drew strong criticism from Gavaskar, who described the Australian "failed former cricketer making a living telling international players to do what he couldn't do". "Steve Waugh and I were similar in some regards and this helped Australian cricket to reach the heights it has. We both challenged the existing parameters and norms, and created a vision of life education outside the dressing room," Buchanan said recalling Australia's dream run during his tenure as the coach. Buchanan also admitted he had a strained relationship with Shane Warne, who always disapproved of the coach's ideas when they played together, but added the bowler's outspokenness was always wondered about. "There was indeed a lot of attention given to the relationship I had with Warne. You must remember we are from opposite ends of the spectrum regarding personalities. "He might have spoken his mind to the press but at least he spoke his mind and you would never die wondering with him. Even though I have massive respect for the person, the player and the entertainer, we have a distant relationship. There is no conversation between us to speak of," he said. Buchanan also felt the furore over his four-captain theory was because it was misinterpreted by most people. "My four-captain policy has been misinterpreted by most people and I would just like to clarify it," Buchanan said. "Basically, I will not select a squad captain but will select a captain for each match. That captain will make all the normal decisions such as field placings and bowling changes," he added. Buchanan felt since Twenty20 was a fast-paced game it was important to have a unique strategy everytime so he wanted a number of minds to increase the rate of success. "However, with a unique, fast-flowing and hectic game like Twenty20 I feel there should be more decision-makers, more captains in the process to succeed, so one has to think differently," he said. Buchanan compared the fast-paced Twenty20 version to a battle. "My favourite book of all time is The Art of War by the Chinese military genius Sun Tzu, written some 5000 years ago. I think this book was written to describe Twenty20 cricket." The book's message is that instead of working on formulaic strategies, life requires rapid and appropriate responses to dynamic, ever-changing environments. The former Australian coach also disclosed why he chose Bloemfontein as the base for Knight Riders. Electing to bat first, the Cobras overcame some initial jolts to manage a modest 142 for eight in stipulated 20 overs, before skittling out the Royals for 115 in 19 overs yesterday. The Royals started on an aggresive note with the opening pace duo of Siddharth Trivedi and Amit Singh dealing early blows removing opener Robin Peterson (1), Andrew Puttick (1) and skipper Justin Ontong (1) in quick succession leaving the home team tottering at 22 for three. However, other opener Derek Brand held his nerves to score 24 off 23 balls with the help of three boundaries and a huge six, before being dismissed by Royals paceman Singh. Soon the Royals bowlers started losing their penetration power as the Cobras' crawl their way back with the help of some crucial innings from its middle order. R Levi sent the ball across the rope for five times, including twice for maximum, enroute his quickfire 36 off just 22 balls, while V Philander (26 off 21) and R Kleinveldt (23 off 17) wield their willows to make crucial contributions. For Royals, Singh bagged three wickets while legendary Australian spinner Warne, Ravinder Jadeja and Trivedi managed one each. Chasing the target, Royals batsmen struggled to negotiate the witty deliveries off Cobras' paceman Kleinveldt, who scalped four wickets for just 23 runs and later was adjudged the Man of the Match. Royals opener R Quiney scored a 22-ball 34, with help of five boundaries and a sixer, but the rest of the middle order batsmen failed to give him company and fell like a pack of cards in the middle. Perry shot two-under-par 70 and Cabrera posted 69 to finish on 205, two better than Chad Campbell of the USA. Tiger Woods and Phil Mickelson, numbers one and two in the world, were lurking on 212 and will be paired together in Sunday's final round. A double-bogey five at the 16th dropped Campbell, the overnight co-leader with Perry, from a share of the lead as he slipped to a 72. Jim Furyk fired a four-under 68 to take fourth place on 208, one ahead of fellow American Steve Stricker (68). Shingo Katayama of Japan, bidding to become the first Asian to win a men's major, was tied with South African Rory Sabbatini and American Todd Hamilton on 210. "I think for me to have a chance it will take a 64 or 65," Mickelson told reporters. "But I think it's out there." A violent storm that swept through Augusta on Friday night dumped 1 ¼ inches (3.17cm) of rain on the course, making greens receptive to approach shots although the players also had to contend with breezy conditions. Perry, 48, trying to become the oldest winner of a major championship, jockeyed for the lead with U.S. Ryder Cup team mate Campbell for most of the round before the latter took two shots to get out of a greenside bunker at 16. Cabrera, the 2007 U.S. Open winner, came back from a three-putt bogey at the first hole to grab a share of the lead with a 12-foot birdie putt at the 17th.